This stand was bought by Bedford Town FC and most of the structure became the new main stand at their then ground in Ford End Road where it survived until the club's lease was not renewed in 1982. Sandy Lane, Tooting & MItcham FC. The old stand is visible in this image. 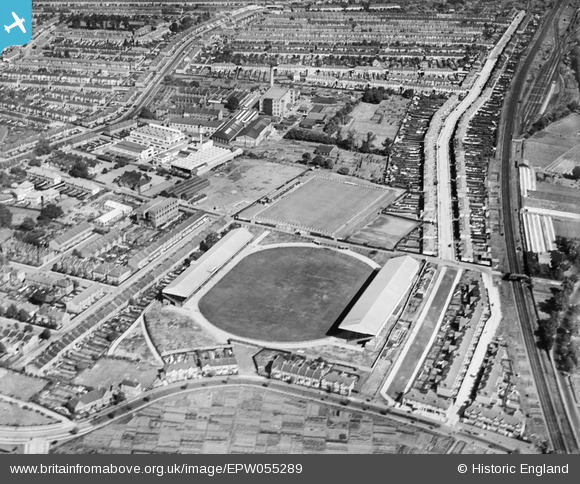 This was Mitcham Stadium now an housing estate. Closed around 1955/56. Main stand (left in photo) bought by Leyton Orient and re-erected at Brisbane Road. The stadium had a brief career as a rugby league venue, but regularly staged an annual rally of the London Gaelic Athletic Association at Whitsuntide, including hurling and football matches.